Kashmiri cuisine is still quite a unknown cuisine for me. Actually i rarely cooked from this cuisine, however blogsphere pulled me to explore this cuisine. I have already two - three dishes from this cuisine. However for this month's Shh Cooking Secretly, a monthly event started by me, which is now hosted by Mayuri Patel we are cooking from Kashmiri Cuisine. Every month we are exploring different regional cuisine of India. After Himachali cuisine, this month's event goes for Kashmiri cuisine. You might know about the concept of this event, actually every month the members of this Facebook group get paired with an another member. Both discuss together secretly to get their two secret ingredients and cook with. Obviously we cook with those two ingredients and share our picture in the group, so that the other members pariticpate to guess the ingredients. Its quite an interesting play and this concept works awesome. We love to find out the ingredients though sometimes its quite a hard task. Jeera rice is a well known Indian dish prepared with cumin seeds and rice. Its quite a popular and well known dish in North Indian cuisine and in some part of Pakistan this dish is an everyday rice dish for many. Quite an easy one pot meal to prepare with less efforts. 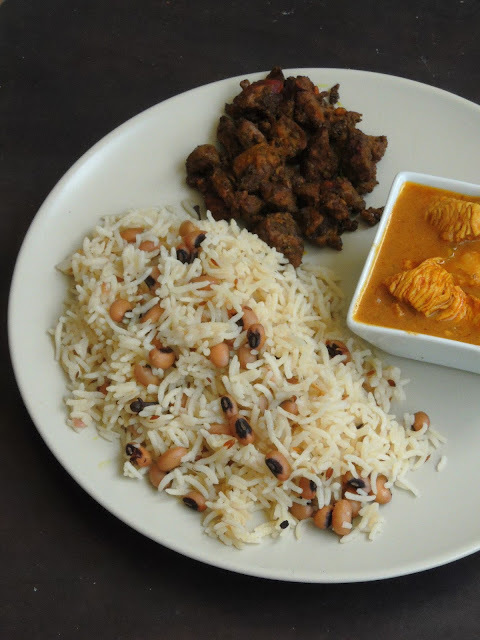 Usually served along with rajma, jeera rice makes a prefect meal to enjoy without any fuss. Cumin seeds when fried in oil, brings an extreme flavor to this simple rice dish. To give a twist i couldnt stop myself to add some already cooked black-eyed peas to this flavourful rice. 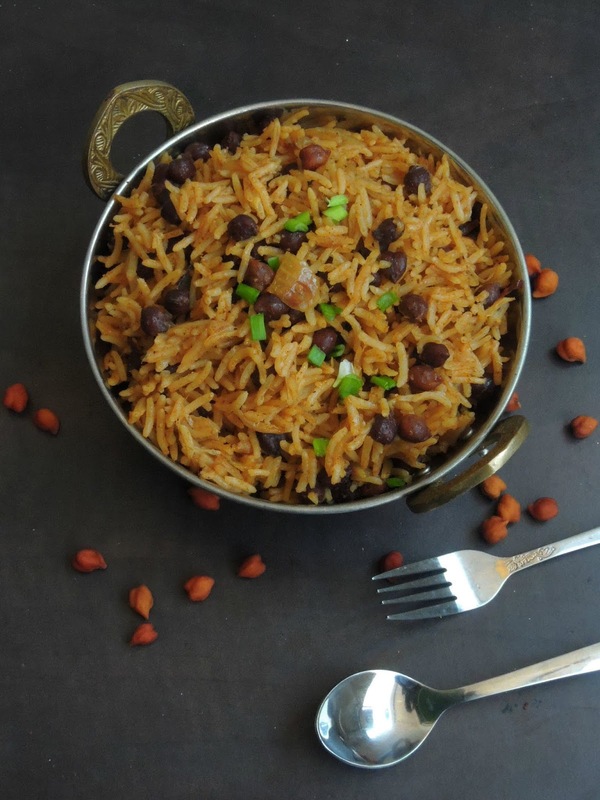 Yes adding lobia aka black-eyed peas to this rice turned this aromatic dish more healthy and rich in protein. I dished out this cumin rice for our weekend lunch and served with chicken kurma and liver masala. Trust me we had a fabulous sunday special lunch. Am an ardent fan of one pot dishes, yes these dishes are quite easy to prepare as they calls for a pot. Most of my one pot dishes goes for Indian pressure cookers. Indian pressure cookers are definitely a blessing if you know how to handle them. I have been cooking with them since my earlier young age and i cant survive without them. Hence i have more than 5 types of pressure cookers. From cooking rice to dishing out a gravy, i always look for pressure cooking. Today's post is a one pot dish as i prepared this complete dish through pressure cooker. 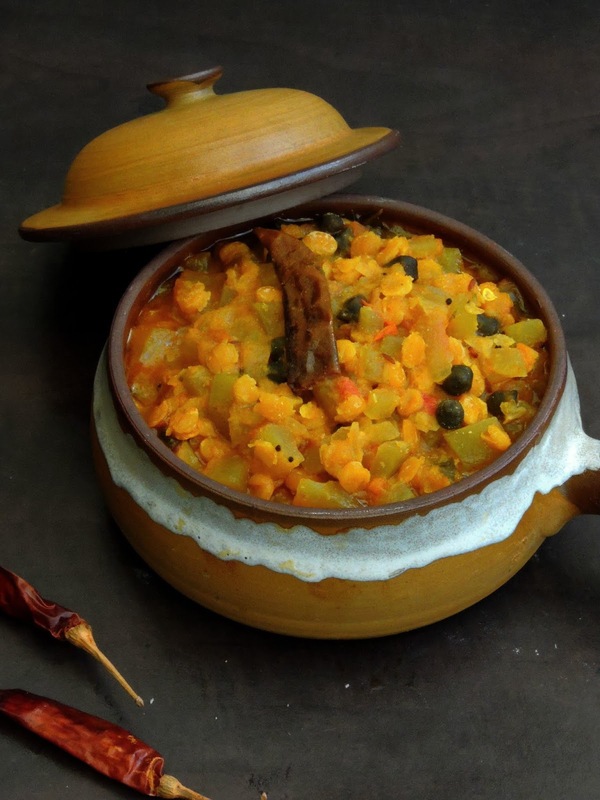 You doesnt need any other vessel for tempering to sauteeing the vegetables, as pressure cooker is quite enough to dish out this fabulous kootu which is quite rich in protein. Looking a gluten free one pot meal which is quite a complete meal, obviously my today's post will definitely fulfil those criterias you are looking for. A simple pulao which calls for one pot cooking. With a dry roasted and freshly prepared spice powder, this pulao gets ready very quickly than you can imagine. No tomato or ginger-garlic paste is needed to dish out this pulao. Already cooked Kala channa aka black chickpeas will take care of the protein content and this dish is completely gluten free. A lunch box friendly pulao which is definitely quick to prepare even if you have dont have enough time early in the morning. This week's posts are going to be one pot meals, yes my theme for this week's blogging marathon is One pot meals. Obviously this flavoursome rich kala channa pulao goes for this week's blogging marathon. 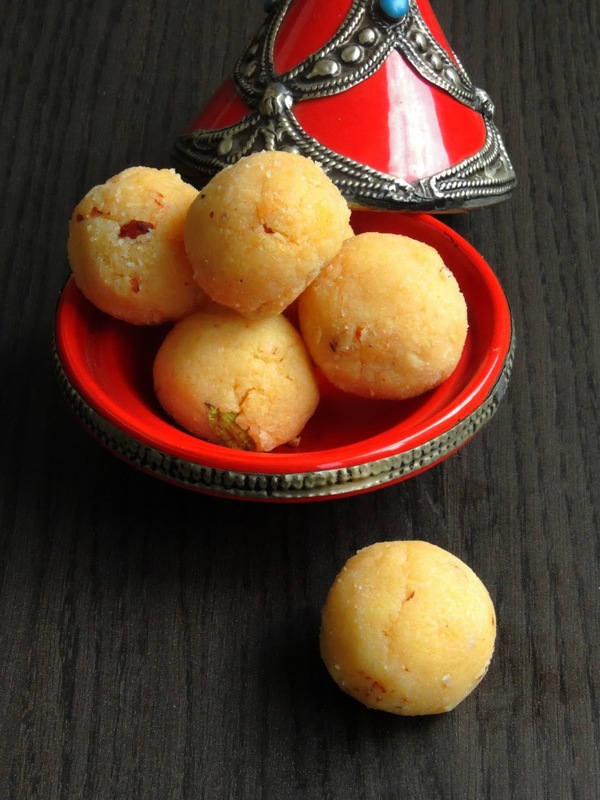 If you are looking for an extremely easy sweets to dish out for some special occasions or else for a festival, dont forget to check this incredible Nariyal Khoya Laddoo. 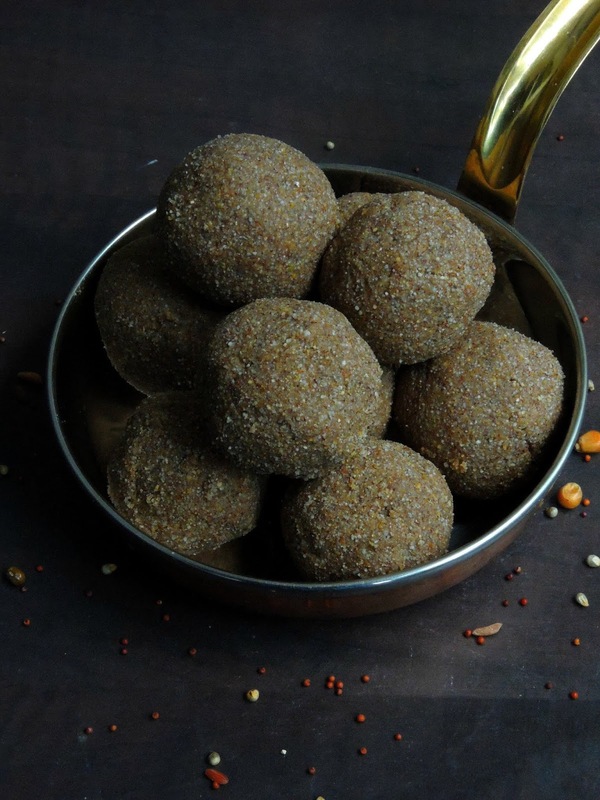 With just easily available ingredients and less than 5 ingredients you can roll out these incredibly delicious sweet balls in an ease. I carried unsweetened Khoya all the way from India and i have freezed them as small portions for further use. 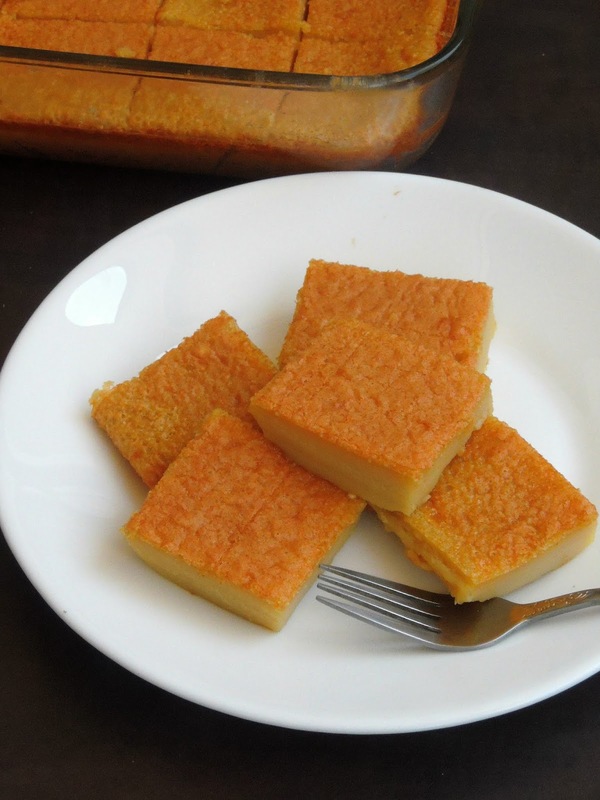 And i have been cooking with those frozen khoya portions for a while, trust me even after few months they are still prefect to dish some ultimate sweets or dishes out of them. You may wonder why i have carried those unsweetened khoya all the way from India, all because of their excellent quality. I have a friend who have her own dairy farm and she got a big packet of unsweetened khoya specially for me, how can i refuse her kind gesture. Obviously i brought them to Paris and those milk solids are ultimate to cook with. A packet of whole multigrains aka Sathumaavu cereals were sitting in my pantry since a while. Though i grabbed this packet of mixed whole multigrains for making the usual traditional porridge with it, i changed my mind to dish out some dangerously laddoos with them. Its quite an authentic sweet balls, which is quite often prepared in many South Indian households just to feed everyone at home with these healthy and nutritious grains. Am running this week's blogging marathon with Make one type of Sweets, though Indians have many delightful sweets, i opted for laddoos. Hence am posting three different laddoos for this week's theme. Yesterday, i posted an interesting puffed lotus seeds and edible gum laddoos which is obviously a delicious sweets to give a try at home, and my today's post is this extremely delicious saathumaavu nei urundai, trust me these balls are dangerously addictive. Phool Makhana aka puffed lotus seeds, its looks like popcorn is a good source of protein, carbohydrates, fibre, magnesium, potassium, iron and zinc. High in fibre and low in calories, its enables weight loss. Makhana seeds can be eaten raw, roasted or ground. The puffed seeds are also used in some Indian sweets liks kheer, puddings and dry roasted snacks. Makhana Phool is also known as foxnut, makhana or gorgon plant. Basically phool makhana belongs to a family called ‘lilly’. Lillly is a flowering plant, that produces starchy white seeds and those seeds are purely edible. This plant is generally cultivated in low land areas of Indian, china and Japan.These countries have been cultivating this plant since many years to get the seeds. This plant is very well ready in its locations with dry and hot summers and even in cold winters. These seeds can be eaten raw, boiled or cooked in Indian cuisine.Seeds are collected in late summers and before autumn. These seeds are commonly used as fried or roasted, they get popped up like popcorn. 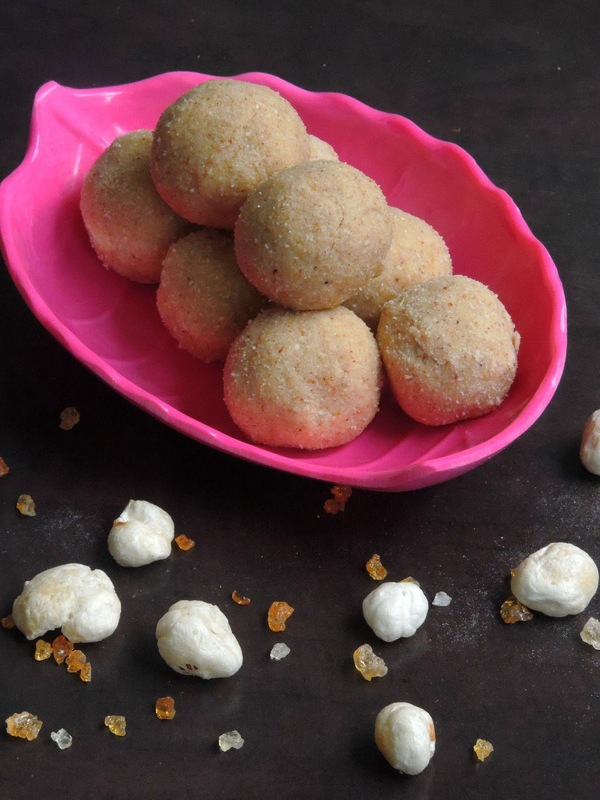 Am running this week's blogging marathon with Make an Indian Sweet as theme, hence i picked to dish out some laddoos. 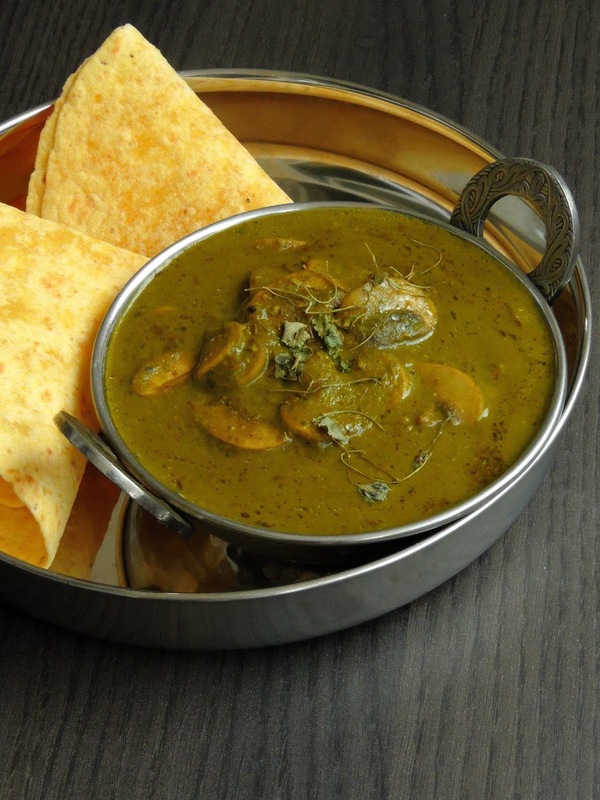 Indian cuisine is seriously vast and each region of India shares many droolworthy dishes. However i learned so many Regional dishes through blogging, seriously now i can dish out some delightful Regional dishes with an ease. However i love learning some traditional Regional dishes especially North Indian foods. Though been born and brought up in South India, my love for North Indian cuisine pulled me to replicate most of the traditional dishes at home. Hence my family can enjoy these delicious dishes which are quite unknown for us until i crossed them through this virtual world. One of my recent trial from Kolkata is this super duper fluffy kachori with lipsmacking potato curry. Yes my today's post is one of the famous and well known breakfast dish from the city of Kolkata, and this dish is a weekend special dish. 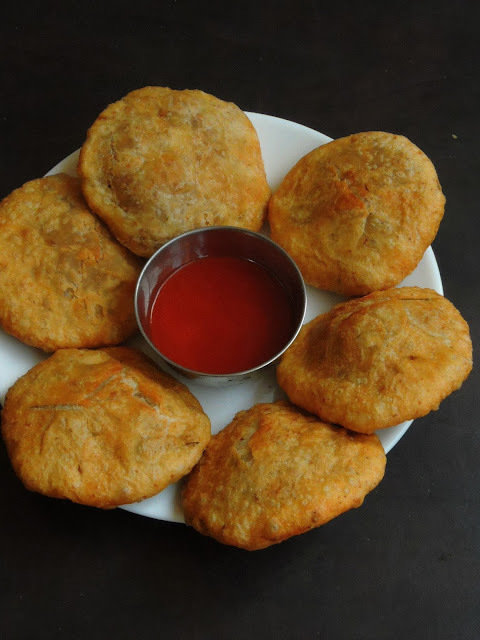 Kachori, we know that kachori is a deepfried dish with stuffing in it. But trust club kachori is completely a different one from the well known kachori liks khasta kachori etc. Pandesal which is also known as Pan de Sal is a popular bread rolls which is quite common in Philipines. Pan de sal which means Salt bread in Spanich is quite a common bread there and this bread calls for usual ingredients like flour, eggs, yeast,sugar and salt. And the particularity of this bread is they are rolled finally on bread crumbs before baking. 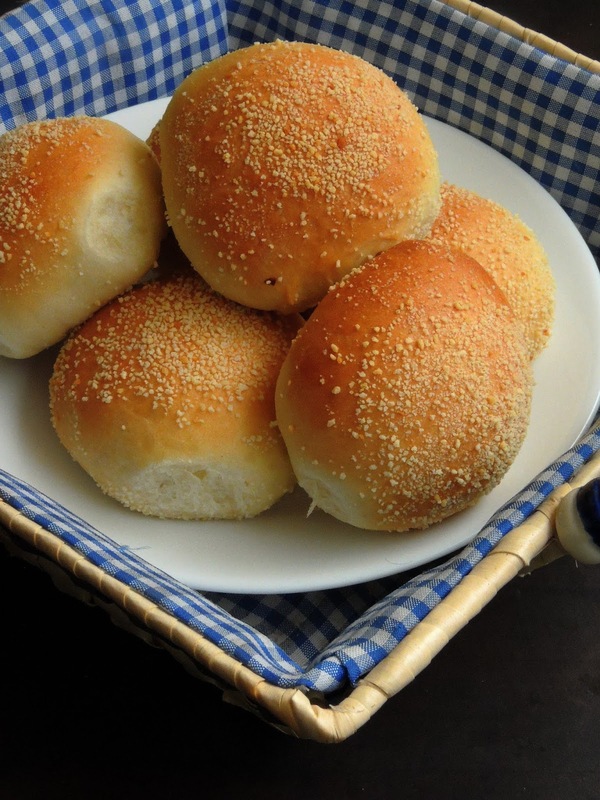 This gives a fabulous look to these bread rolls. This bread is a most known among the Filipino bread do exists. This bread tastes slightly sweet, absolutely soft and fluffy white bread rolls to enjoy with some salted butter and jam. But we loved this bread rolls with both nutella and honey. Yes this cuties are dangerously addictive and this rolls reminds me of our own milk buns do exists in most of the bakeries in India. Srilankan cuisine, this cuisine is one of my favourite after Thai and Chinese cuisines. Whenever i get a chance to cook from this cuisine, i wont hesitate a second to check their delectable dishes to grab something interesting from this incredible cuisine. Though i have cooked couple of dishes from this cuisine, am yet to dish out many interesting recipes. However my today's post is a fantastic evening snack foods which is quite well known in Srilanka. Yes this Srilankan rolls are savoury rolls which can prepared either with meat to vegetable filling. 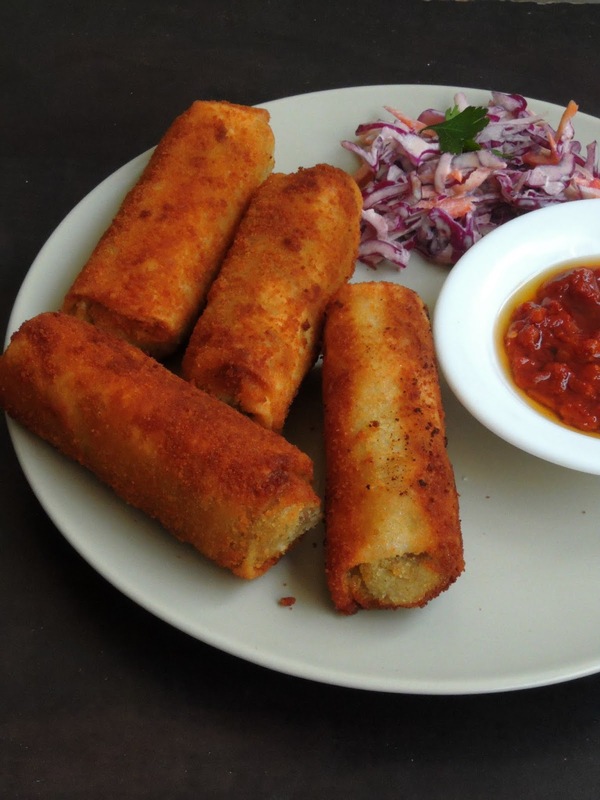 Srilankan rolls are absolutely my kind of snack foods, these rolls are as much as like Chinese egg rolls which calls from Egg-roll wrapper, filled with spicy filling which is later breaded and fried until they turns golden brown. Though i have already posted a vegetarian version of Srilankan Rolls, here comes an another meat version of Srilankan Rolls. Onion kachori is known as pyaaz ki kachori, and this dish is quite a fabulous snack dish. Though this stuffed snack supposed to have their origins from Uttar Pradesh or Rajasthan, now these kachoris are quite famous around India. 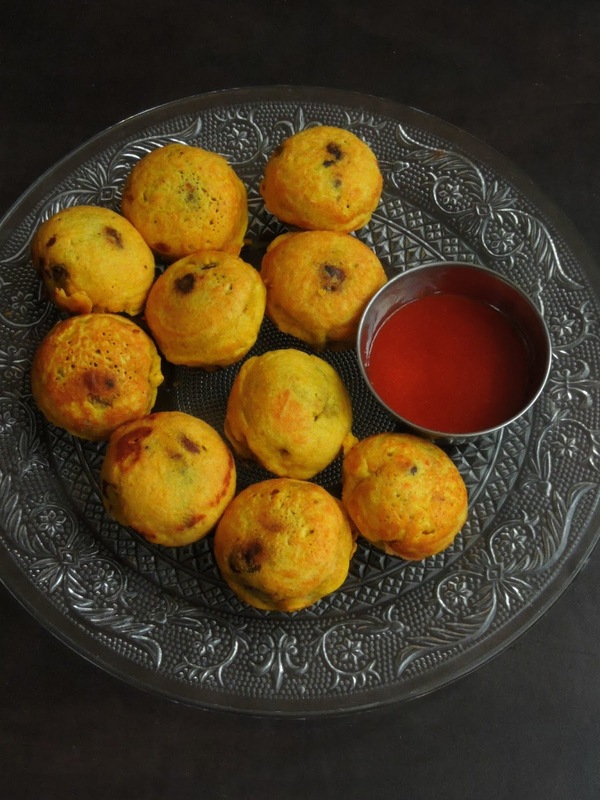 Kachoris are often served with chutneys made with tamarind, mint or coriander. The most popular Kachori is made with yellow moongdal or urad dal spiced with red chilly powder and few more spices. Kachori stuffed with green peas is quite known in Bengali cuisine as well. However kachoris do exists in Sweet version also. 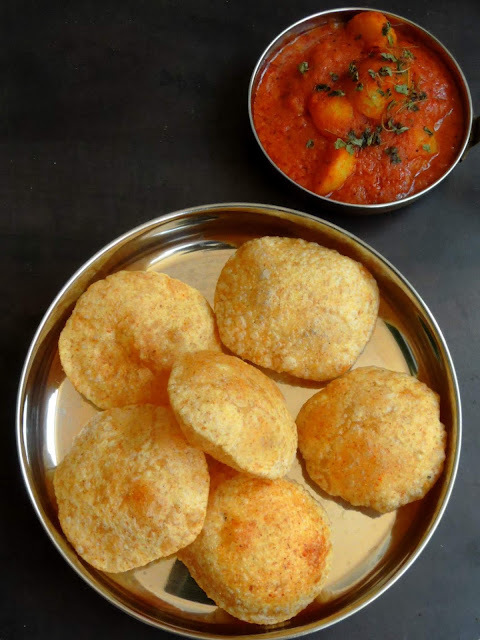 Mawa kachori is one of the delightful sweet kachori which is very popular in Jodhpur and this kachori is dipped in sugar syrup. Do you know Kachoris are also known very much in Trinidad and Tobago, Guyana and Suriname. My kids are ardent fan of mozzarella cheese, obviously my fridge and my freezer will always have this cheese chunks. We dont forget to add them in our salads, however i love to bake with these cheese. This mozzarella cheese works awesome in many breads, stuff them or top them, these cheese brings a fabulous touch to anything cooked with. Few days back i tried baking some cheesy bread sticks to enjoy as an accompaniment for our dinner. 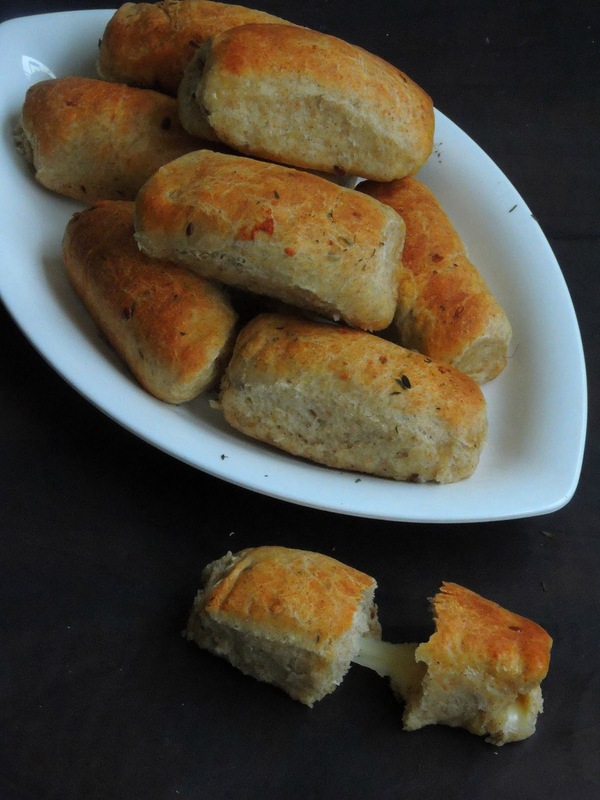 And this bread sticks are completely eggless, i also used both all purpose flour and whole wheat flour with pizza seasoning and herbs to bring some flavor to this ultimate bread sticks. These bread sticks came out extremely fabulous and everyone at home enjoyed while these bread sticks were still warm. Yes that melted cheese while enjoying this bread stick have no words to explain how delicious this incredible bread sticks will be. You all might know about the popular street food aka Batata Vada. Its one of the most famous fast food in Maharashtra. These batata vadas are nothing but potato fritters. The name Batata comes from Portuguese who brought potatoes to India. Its a deep fried food which calls for mashed and spiced potato ball which is later coated with chickpea flour,served along with chutney. Batata vada is served typically with green chillies and with varieties of chutneys. Batata vadas is often eaten in form of Vada pav. Its also an another popular street food. Though this potato fritter is prepared usually with mashed potatoes, i tried my hands by combining the healthy and protein rich cooked and mashed rajma along with potatoes. And i named my today's post as Rajma batata vada, yes this batata vada tastes extremely delicious and prefect to munch for an evening snacks.